Inducted 2000. “Chili” Longtime Volunteer and Booster. It would probably be easier to list all the things McLaughlin hasn’t volunteered for during the past 20 years. He has lent a helping hand in nearly aspect of every sport at Notre Dame since he was first asked to be a scorekeeper, public address announcer and van driver for the volleyball team in 1979. First, the nickname. McLaughlin was tagged with the name “Chili” by golfing buddy Terry Traeder because he would always stop at the clubhouse to eat a chili dog or a bowl of chili midway through a round of golf. “The next thing I know, Chili Mac came alive,” he laughed. Along with his behind-the-scenes contributions with the volleyball program, McLaughlin has been a scorekeeper, announcer, timer, scoreboard operator and van driver at various times for the softball, football, boys soccer, and boys and girls basketball teams. He is a past president of the Athletic Committee (2 years) and the QND Athletic Booster Club (4 years). 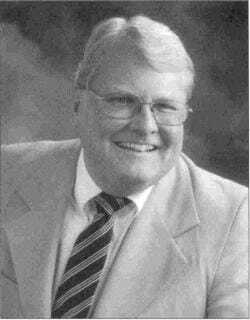 He has been a member of the QND Hall of Fame Committee since 1991, and he’s still on the Athlete of the Month Committee. McLaughlin is also a certified official for softball, baseball, basketball and volleyball. McLaughlin says his biggest thrills came in 1980-81, when the volleyball team went undefeated to win the state title in the fall and the softball team went undefeated to win the state title in the spring, and in 1985 when the boys soccer team won the state title. “Getting thrown in the mud by all the kids (following the victory over Collinsville) was a real thrill,” he laughed.